Cool Alternatives to the Sunday Million | Big weekend tournaments, which have very soft fields. 180 Player Sit N Goes | First of 3 articles covering these popular bankroll builders. When To Fire A Second Barrel? Playing Great But Still Losing? Read This! Chance Of Meeting AA With Your KK! Nothing can beat the feeling of winning a multi-table poker tournament, and this area of the site is dedicated to helping you do exactly that. What makes tournament poker so attractive is the potential for turning a small buy-in into a prize worth $1000’s or even $10,000s… With online poker tournaments starting (literally) every minute of every day, there have never been more opportunities to break through. Before I get to the skills required to beat Multi-Table Tournaments (MTTs for short) it is amazing just how many types of tourney are available these days. From humble beginnings of single-entry games (freezeouts) with the occasional rebuy game, there are combinations and quirks to keep you coming back to the tables again and again. Turbo Tournaments: Turn up the speed of the blinds and the pressure to make moves increases for all the players. Also a great option for those players who do not have the luxury of sitting up for half the night playing! Knockout / Bounty Tournaments: Here the prize pool is split, you get a bounty prize for each player you knock out, as well as prizes for the late finishers. The proportion of bounty to prize varies from site to site, the bounty portion usually ranges from 20% to 50% of each players buy-in. Satellite Qualifiers: Tournaments which award prizes of tickets to even bigger tournaments (both live and online) are big news these days. These are a great way for smaller bankroll players to win entry into games with potentially career-changing prize pools, including live events like the World Series of European Poker Tour events. Sunday Majors: This is a collective term for the biggest tournaments of the week, which are mostly held on Sundays at the different poker sites. The biggest of all is the ‘Sunday Million’ at Pokerstars, which guarantees a million each week. There are similar games elsewhere, and plenty of satellite qualifiers to get you a cheap ticket into the big events. Online Poker Events: Most poker sites now run tournament festivals, online events which have bigger buy-in games – many with guaranteed prizes and dedicated satellite qualifiers. These range from the huge ‘World Championship of Online Poker’ at PokerStars to the iPOPs at Titan, Power Fest at Party and right through to niche / smaller events at the mid-sized sites. These are a great way to break through to the next level, and often come with bonus offers and special promotions that the sites use to make sure that the tables are full. Tournament play requires a unique skill set. You need to be able to play with ‘deep’ stacks, which includes post-flop play, hand reading and many of the skills associated with cash game poker. In addition you need to be able to assess situations and ranges of hands later in the game, making big moves at just the right time to accumulate chips based on stack sizes, ranges and the state of the game. You also need to be able to play under pressure of huge prize increases at the final table and master the high-pressure of short-handed and heads-up play. Your reward for getting everything right (+ having a good run of cards!) can be a huge payout. Many of the articles on this page will specifically guide you through the situations and puzzles which you will encounter along the way to winning tournaments. Here is a selection of articles covering the key parts of tournament strategy. Basics: I recommend you get to know the different stages of tournaments and how your strategy needs to change with the stack sizes and situations before you jump into the details of ‘making moved’. This will give you a solid foundation on which to build specific skills – starting with the minefield of bad opponents in the early stages and all the way through to the excitement of your first major final table. My beginners list contains everything you need, from pre-flop basics through the strategy essentials and a guide to choosing the best beginner tournaments, which will enable you to build your bankroll at the same time as your experience! General Strategy: Poker tournament strategy is something you will never tire of learning, and the general strategy articles cover a rich and varied number of topics. These range from specific moves such as 3-betting, continuation betting and managing the pot size – through to overall ideas like small ball poker and adjustments for turbo tournaments. Choosing The Best Tournaments: Having a great understanding of the strategy is just one aspect of making profits from poker – you also need to choose the best games. There are huge differences between the poker sites, particularly in the average experience level of the other players. By choosing sites with a regular flow of new and recreational players, you can potentially double your profits. Check out my article on the best sites for poker tournaments for more on this important topic. 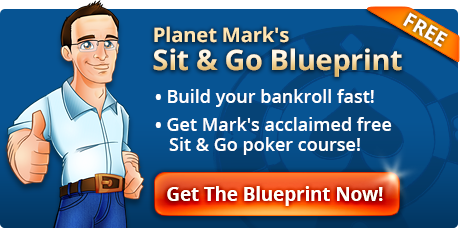 Of course, I have provided strategy for the different types of tournament too – so whatever game you prefer, Sit N Go Planet is your first stop for online poker tournament strategy.